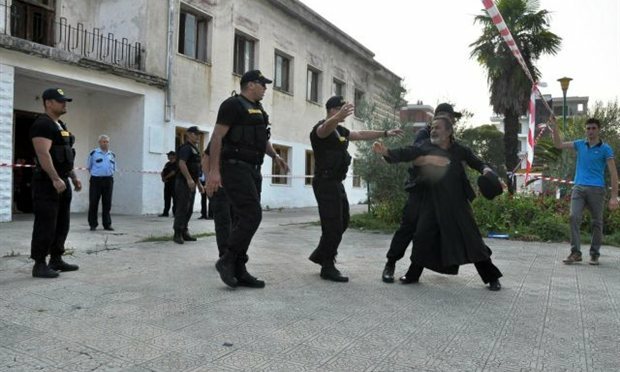 The Christian Orthodox Church of Albania has condemned the violent ousting of clergy and believers from a temple in Premeti, during the celebrations for the Assumption of the Virgin Mary on the 16th of August, by private security guards and municipal authorities. Worshippers and clergy refusing the leave were violently removed by municipal police, while religious artifacts such as religious icons and utensils were confiscated. On Monday local residents reacting clashed with police outside the church, demanding that they be allowed to resume services. The church was evacuated under the pretext of following a court order, which stated that the building be returned to municipal authorities. According to Albanian legislation, the building must function as a culture center. During his lecture at the Cathedral Temple in Tirana, the Archbishop of the Orthodox Church of Albania Anastasios commented that the ousting harkened back to the communist era in Albania, when religious beliefs were banned. He also demanded that the Albanian government fulfill its 2009 promise to return seized church assets. Regarding the legal pretext, Archbishop Anastasios explained that the Albanian recognized that the cultural center was built on top of a Christian holy temple and handed it over to the Church in exchange for the cost of converting it. In the past the Church has repeatedly been vandalized, with the clergy alleging the attacks have municipal backing. The spokesman of the Minister of Foreign Affairs of Greece Mr Konstantinos Koutras commented that the violent ousting of the clergy and believers from the temple “are unacceptable, condemned and without any legal backing”. The violence was also condemned by former President of Albania and outgoing Prime Minister Sali Berisha. 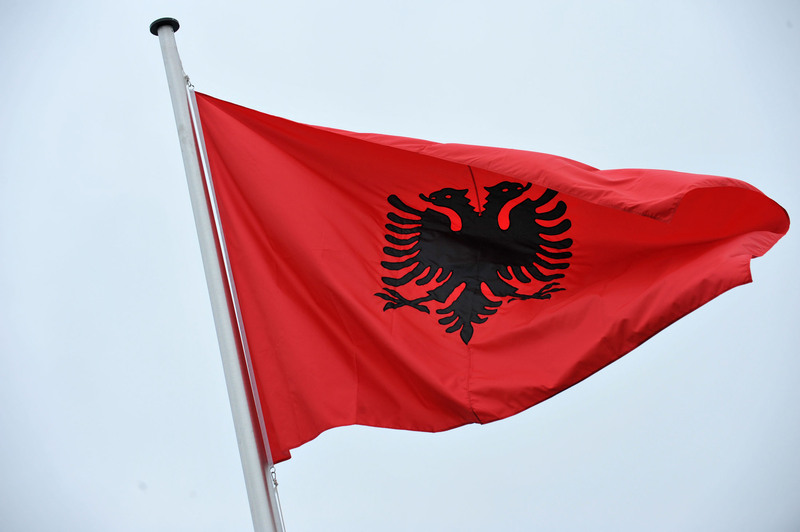 It is about time that the Albanians stop saying they condemn these incidences and actually take “action” against such discriminations and persecutions of the nation’s indigenous Albanian and Greek Orthodox Christians. They cannot keep on protesting at the behaviour of their fellow Balkan neighbours’ attitude and treatment of Muslim Albanians in their nations, when they have never practiced what they demand others to do. Nor have they ever stopped Albanian nationalist jihadists and revolutionaries in various places, like Kossovo, to desist from stirring up troubles or subversions & massacrering its inhabitants. In the example of Kossovo; the effort was to break away from Serbia which had in times past, granted asylum to many Albanians who settled within it. But with the subversive military cessationist effort that saw many Serbs persecuted or killed, it precipitated an equally murderous response from the former Serbian president Slobodan Milosevic. Yet we know that for years Albania has been aspiring to expand her boundaries into Montenegro, Serbia, Fyrom and Greece, often with Turkish blessing, concurrent Western support or indifference, and jihadist militia often armed and financed by Saudi Arabia and the Arab Gulf states. But in all this geopolitical scene we should note an irony, in that Orthodox Christianity is very much part of the identity of Albania, since Albania was once a staunchly devout Orthodox Christian nation that sacrificed much for the Faith and fought to preserve it and the nation. And because of this attachment to Orthodox Christianity, the Albanians put up a resistance struggle against the Ottomans that was one of the most toughest and brutal ever encountered in Ottoman history. And we might add, that even the Albanian national flag, bears testimony to this Byzantine Orthodox Christian heritage, thus revealing that Albanians and the Albanian nation was Orthodox. The conversion to Islam had more to do Ottoman manipulation, the oppressiveness of Islamic apartheid (dhimmitude) and the temptations of personal gain and advancement. This apostasy paved the way for many Albanians to become military governors and lackeys of the Ottomans who oppressed many of their former co-religionists. A legacy of bad blood created between Albanians and many of their Balkan Christian neighbours. So the question remains, will the Albanian authorities make an effort to override this nasty legacy and show due respect towards their native Christians? Or will they continue in pursuing a policy of militant national expansion underpinned by an Islamic identity bent on oppressing “infidels”? Previous: Did a culture of insatiable greed turn an entire generation into crooks?